The flight of a new butterfly is liable to create a major stir in the watchmaking universe. In any event, their flutterings are bound to stir the hearts of all informed devotees of horological complications, who will be thrilled by the Bulgari Papillon Heure Sautante model that reinterprets the ingenious patented minutes indication system. This original mechanism, a metaphor inspired by the flight of the butterfly, is unique in the world of Haute Horlogerie and bears two independent, retractable, diamond-shaped hands on a supporting disc. Each one alternately sweeps over a graduated minutes scale spread over a 180-degree half circle. The minutes are successively indicated by each of the two hands. The first is positioned on the segment and thus signals the progression of the minutes, while the second one remains ‘off-duty’ in retracted position and thus invisible throughout the rotation of the disc bearing them. When the first hand reaches the 55th minute on the display segment, the other hand progressively completes a quarter turn to move into a position parallel to the first one on the 00 minutes marker. The first hand then moves into its retracted position for the following 55 minutes. 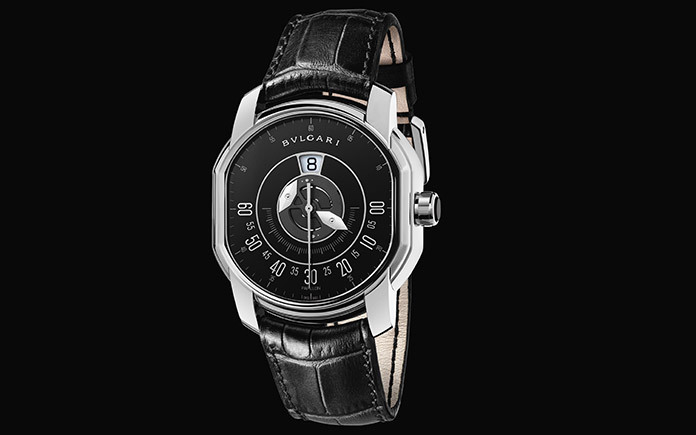 In the case of the simplest display of time, the Bulgari Papillon Heure Sautante watch displays the jumping hour, indicates the minutes via the “Papillon” device, and shows the seconds by the central hand. 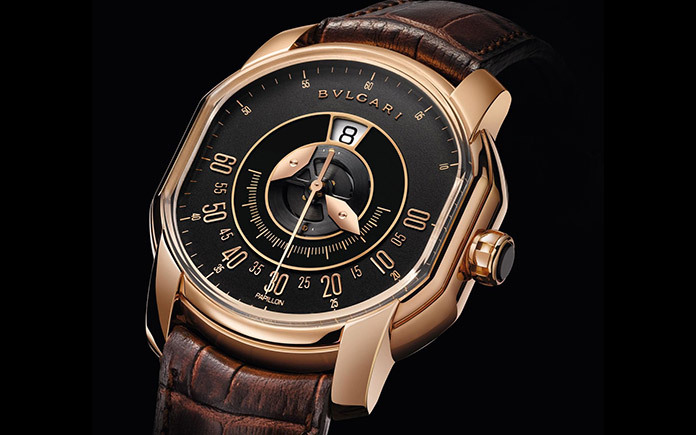 The entire mechanism is powered by a mechanical self-winding Manufacture movement, Calibre BVL 252, entirely designed and assembled in line with the finest traditions by master watchmakers from Bulgari Manufacture. It beats at a frequency of 28,800 vibrations per hour and has a 42-hour power reserve. This movement is decorated with great care and elegance expressed through alternate circular graining and the Côtes de Genève motif. The steel elements that are visible are satin-brushed, polished and bevelled, as are the screw heads. The 18ct white or rose gold case, with its elegant 45 mm diameter, suggests a certain degree of power while measuring just 11.30 mm thick. Attentive enthusiasts will enjoy complete freedom to contemplate the beauty of the finishes and the precision of the movement in motion thanks to its sapphire crystal case-back. 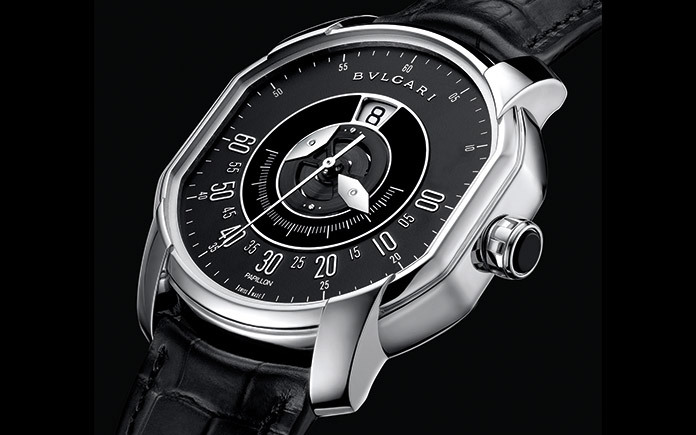 But Bulgari takes it a step further. The Maison has decided to push its quest for complexity by combining its Papillon brevet with the most prestigious of watchmaking complications. In a manner combining elegance and sophistication, the new Bulgari Papillon Tourbillon Central incorporates this high-precision movement into the very heart of the watch with the jumping hour display indicated by a disc rotating past a 12 o’clock aperture. At the end of the 60 minutes indicated by one of the “Papillon” hands, the disc jumps and displays the new hour in the window. While the extreme sophistication of this construction that involved particularly intricate development will delight devotees of all things technical, one must admit that certain that mysteries of this nature are sometimes inaccessible to laypeople. And so the magic weaves its spell in step with the enchanting beauty of the tourbillon – released from gravity to spin swiftly and freely inside its hanging carriage. With the Papillon Tourbillon Central watch, the Bulgari watchmaking Manufacture places the tourbillon movement in the very centre of the case of this precious, unique timepiece available in pink gold or platinum, in the same way that a diamond is set in the centre of a piece of jewellery. 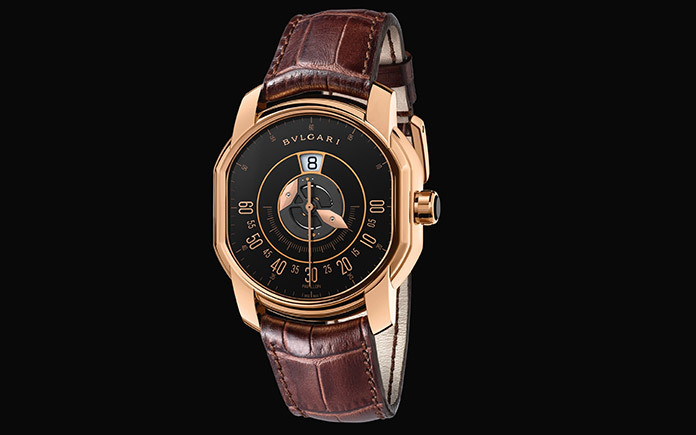 The entire composition stands out by its clean lines, symmetrical axes and the architectural precision of the dial – further demonstrating the mastery of these fundamental elements in the array of contemporary creations by the Maison in the rarefied spheres of “grand complication” watchmaking.